We all know our words and actions can go global. In an instant, the slightest faux-pas can have a lasting impact on a career and a reputation. Have you ever been stuck in a sticky work situation, afraid to do or say something wrong? Do you ever feel awkward or freeze in a corporate setting? If you answered yes, to any of the above, then this book is for you! What to wear to an interview, a cocktail or on Casual Friday. How to walk into that dreaded networking room. How to eat at a five-course gala. What to offer (or not), as a follow-up thank you gift and everything else you need in order for you to shine, get the promotion, and recession proof your job, oh, and don’t forget your techno manners! Whether you are a career-starting graduate, an award-winning scientist, or a globe-trotting CEO, Etiquette: Confidence & Credibility, will give you the interpersonal skills intelligence necessary for professional success. Julie is HuffPost Canada's guru for getting people out of sticky situations and into smooth sailing. Her book inspires as much as it teaches. What a great book! Learning about the circumstances that prompted you to re-prioritize your life and change careers was very touching. And your story of how your dad taught you to shake hands tugged at my heartstrings. You share so many special and memorable lessons throughout the book. The comprehensive templates, tips, and truths in your book are incredible, and everything is so beautifully laid out and well organized. Your effort, time, and dedication is truly apparent in the quality of your messages. You offer readers valuable strategies to help them find success, and your personality shines from each page. Your book is fabulous! Great book. A must to learn about everyday etiquette: be more confident in any situation. To put in all hands. Julie has written a book that is vital for anyone who wants to further their career, change careers or increase their professional presence. With humor and real life scenarios, this book is a fantastic tool to help enhance their success in all areas of life! In her book, the author clearly demonstrates the usefulness of knowing how to manage and conduct your professionnal life in our world today. Most importantly, this book will help you differentiate yourself in a very competitive business world. A must have book for students and future professionnals. Times have changed drastically in recent years and thereby changing the Business Environment in which we evolve in. This Reference Guide is an exact reflexion of this evolution and provides simple, effective and very useful solutions! All members of my family have read it and all have learned something! It's one to leave on your coffee table to read and reread overtime. A must read for anyone aspiring to reach the top. No matter the industry, proper etiquette can pave the way for success. This book is a must read for anyone working with fellow humans. This book gives practical advice about simple ways to enhance your image and improve first impressions and more. Julie's advice always comes from a place of kindness and preparedness, never from a place of pretentiousness. We have all seen a co-worker put their foot in their mouth, show up for work dressed inappropriately or feel unsure about how to handle a difficult boss. This book teaches you how to appropriately handle yourself at work, which is skill we all need to work on. 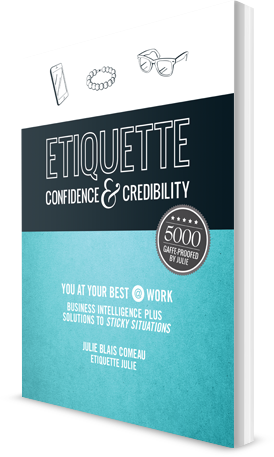 Julie's advice is funny, thoughtful and practical, she has provided me with a great "toolbox" of workplace etiquette. Dear Ms. Comeau: Thank you for this friendly reminder on proper etiquette! I enjoyed your writing style and the examples you gave are very understandable. As you may know, I am studying for a sommelier exam I am taking later this month. In addition to a detailed written and tasting portion, I will need to present a restaurant Service role play for twelve minutes. My etiquette and poise must be at their best if I am going to pass! I will definitely reread your book before taking my exam! The information is presented clearly and is useful for making a good impression in any setting. I got the book for reference after attending the author's workshop at my university and I've found it useful as I made the transition from school to workplace. I think most people considering this already have good manners (if you care enough to seek this out), what you can expect to get out of this book is to know what's acceptable/expected of you in professional/social settings. It's likely some things in here will come to you naturally and other things you hadn't thought of before. Just remember when you don't follow good manners/etiquette in the workplace, people will judge you but won't correct you for it, so you might be projecting behaviours that aren't showing you to be professional you're aiming to be. I attended a training workshop given by the author and had to read the book! Very good advice, I highly recommend the book. Each newsletter keeps you up to date on the contemporary rules of business etiquette with tips and tricks, to make you shine at work and ultimately develop new business opportunities.